Newly released FBI figures show that last month saw the most gun-related FBI background checks of any August on record. The National Instant Criminal Background Check System, or NICS, conducted 1,853,815 checks in August. That's over 100,000 more checks than the previous record set last August. It is also the 16th month in a row to set a record. The number of NICS checks considered one of the most reliable gauges for how many guns were sold. Nearly every sale made through a licensed gun dealer, whether it's made inside a store, online, or at a gun show, is required to complete a NICS check. However, the measure is not a one-to-one recording of gun sales for a number of reasons. Most states do not require NICS checks on sales between non-dealers. Some states also use NICS checks in their concealed carry application process where no gun is sold. "These statistics represent the number of firearm background checks initiated through the NICS," the FBI report noted. "They do not represent the number of firearms sold. Based on varying state laws and purchase scenarios, a one-to-one correlation cannot be made between a firearm background check and a firearm sale." August's numbers represent a return to seasonal trends after both June and July outperformed their previous figures. Though August 2016 saw more sales than any other August on record, it also saw fewer checks than any other month this year. 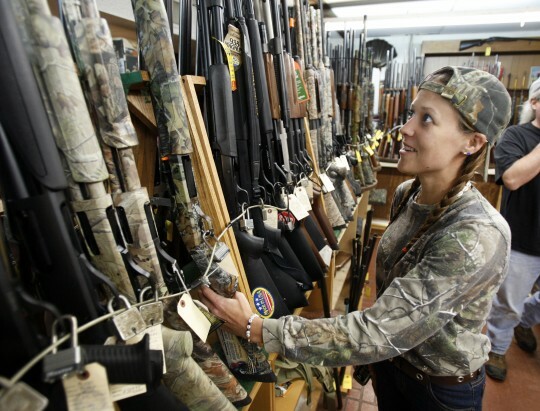 Guns sales generally slow during summer months. The slight retreat in the margin of record-breaking sales coincides with a presidential election that has largely focused on issues other than gun rights and gun control. Though the candidates have staked out opposing viewpoints on firearms, the issue took a backseat during the campaign in August. Still, polling has begun to show the gun ownership rate rising as the more-than-year-long record setting trend continues. Nearly 110,000,000 Americans now report having a gun in their home. Though the campaign hasn't focused on gun rights recently, gun rights activists still see prominent Democrats' calls for new gun control laws as a major driver of gun sales. "Hillary Clinton and President Obama's continued calls to erode Second Amendment rights have backfired," the Second Amendment Foundation's Alan Gottlieb said. "There are now more homes with gun ownership and that number will continue to rise."